After hearing a truly remarkable performance by the Lucerne Festival Academy Orchestra (cross-reference below), it seemed an excellent time to sit down with the Canadian contingent of this 130-member international ensemble whose careers in music are about to begin in earnest. The five musicians (Jeffrey Dyrda, violin—Oakbank, Manitoba; Carmen Moggach, viola—Winterburn, Ontario; Marcin Swoboda, viola—Peterborough, Ontario, Eve Tang, viola—Toronto, Ontario and Sean Rice, clarinet—St. John’s Newfoundland and Labrador) grabbed a quick take-away from the KKL World Café and we assembled three floors higher in the media centre. With only an hour between rehearsals, time was at a premium. As is the custom, each was asked what piece of music came to mind as one of the turning points in opting for a life as a performer. In random order, here are the replies: Ravel’s Daphnis and Chloé, César Franck’s Violin Sonata in A Major, Brahms’ Piano Trio in B Major, Clarinet Quintet in B Minor and Schumann’s Piano Quartet in E-flat Major. The standard procedure to become a member of this illustrious ensemble is to forward an audition tape and await the result. Two of this group were three-year veterans; everyone was most enthusiastic about the opportunity of being conducted by Pierre Boulez and coached by members of L'Ensemble intercontemporain. After a few minutes of background chat, we dug a little deeper into the experience so far in 2010. With five active participants sharing their thoughts nearly simultaneously, what follows are the collective replies to the various questions. JWR: Now that your three-week session is almost over, what have you learned most? Canadians: It’s such unusual repertoire [the focus is on twentieth century breakthrough/landmark repertoire and present-day “New Music”]—our coaches have really focussed on the music’s complexity, especially rhythm. We’ve seen that a great conductor is a great “rehearser.” Boulez’s clear, efficient gestures are really full of meaning. Seeing him explain the procedure to the conducting students helped us understand even more. There is so little ego involved that it’s much easier to focus on the music. JWR: As you’ve said, there’s a lot to do in such a short space of time, what have the challenges been? JWR: Obviously you are all well on the way to establishing yourselves in the music world. What sort of career do you see for yourselves down the road? Canadians: Joining an orchestra seems more likely than starting a chamber music group [Dyrda is about to join the Calgary Philharmonic]—the orchestras are great for income; finding just the right partners for chamber music is a lot more difficult. 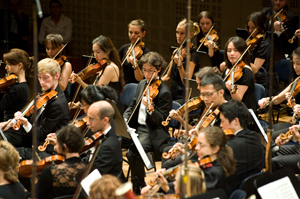 Playing in the front or back stands [especially for string players in the larger orchestras] doesn’t matter so much if the quality is really high [as we witness almost nightly here with some of the finest orchestras in the world coming to town for 2-3 concerts]. JWR: The future of classical music has been debated for years. Recently in Atlanta, it was the subject for the League of American Orchestras’ annual conference. What is your view? Canadians: There will always be an audience as long as we continue to make good art. In Canada, the education system needs to be improved. Playing concerts in the schools is an important way of showing kids what’s out there. There’s no problem performing even Elliott Carter—they hear it as interesting if a bit weird. The biggest problem is the concert organizers—they don’t give their audiences enough credit [and program too conservatively]. JWR: Just a few days ago, it was a very special moment to see Maurizio Pollini invite Pierre Boulez to share the KKL stage after a spectacular performance of the prolific composer’s Piano Sonata No. 2. Seeing those two gifted artists—one the creator, the other the re-creator—together makes one wonder, who will step into their shoes? Canadians: We can’t name names right now, but that sort of relationship is probably happening in other parts of the world—it just takes composers so much longer to become as well-known as someone like Boulez. During the festival’s 38-day run, a wide variety of non-musical activities will be sampled both in Lucerne and other parts of Switzerland. Because of the excellent local and inter-city transportation system, there’s plenty to see and do within a day’s reach and still be back for the next concert.